Despite the credit crunch and weak state of sterling the holiday island of Lanzarote still expects to welcome well over one million tourists this year. The bulk of them from the UK and Eire. And anyone planning to visit Lanzarote this summer can now get their hands on a comprehensive 96 page guide to the island – entirely free of charge. Lanzarote Guidebook has been created by long term island residents in order to provide visitors with accurate and up to date information about the Island of Fire. Along with plenty of inside tips about the best places to go and things to see and do. Lanzarote Guidebook contains comprehensive information about all of the island’s resorts, towns and places. Including maps for each resort. Along with coverage of all of Lanzarote´s many attractions. Such as the Timanfaya Volcano Park and the Jameos del Agua. Discover the work of César Manrique – the island born artist and architect who campaigned for the controlled development of tourism on the island. Find out more about upcoming events this summer – such as the Jazz Canarias Festival and the fiesta of Nuestra Señora del Carmen. For those who like to explore and enjoy days out Lanzarote Guidebook also features an overview of the islands most breathtaking beaches and information about the best excursions on the island. Including kayak tours, catamaran trips and submarine voyages. Lanzarote Guidebook also contains a handy Essentials section. Which covers all of the holiday nitty gritty such as bank opening times, hiring a car, driving on the island, duty free allowances, shop opening hours and a list of emergency contact numbers. This indispensable guide is published in a handy and portable A5 format and is distributed free to tourists on the island via car hire companies, hotels, tourist information offices and private villas. Visitors to the Lanzarote Guidebook website will also find even more in-depth and detailed information about the island online. They can catch up on all of the latest island news, check live weather reports and use in-depth climate information to work out when best to visit. Whilst browsing one of the best selections of Lanzarote villas and apartments online. Spring is here – and so is the new guide book! Last year I wrote about a free guide book to Lanzarote that was available online. Now an updated version has appeared for the spring months. 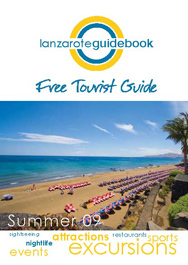 The 104-page guide book is available as a download free of charge from the site lanzaroteguidebook.com and contains up-to-date information with ideas on things to go and places to visit, as well as vital information such as bank opening hours, driving tips and emergency phone numbers. In addition to the download, 10,000 copies are being distributed to visitors, free of charge, via local car hire companies and tourist information offices on the island. But if you are planning a visit to the island this year, then I recommend that you download it before you go so that you can start planning your holiday right away.